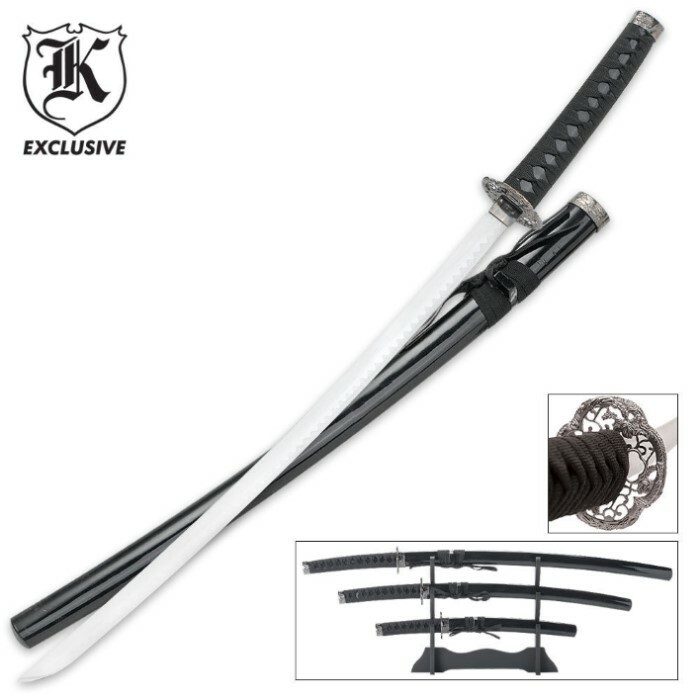 3-Piece Classic Black Samurai Sword Set | BUDK.com - Knives & Swords At The Lowest Prices! 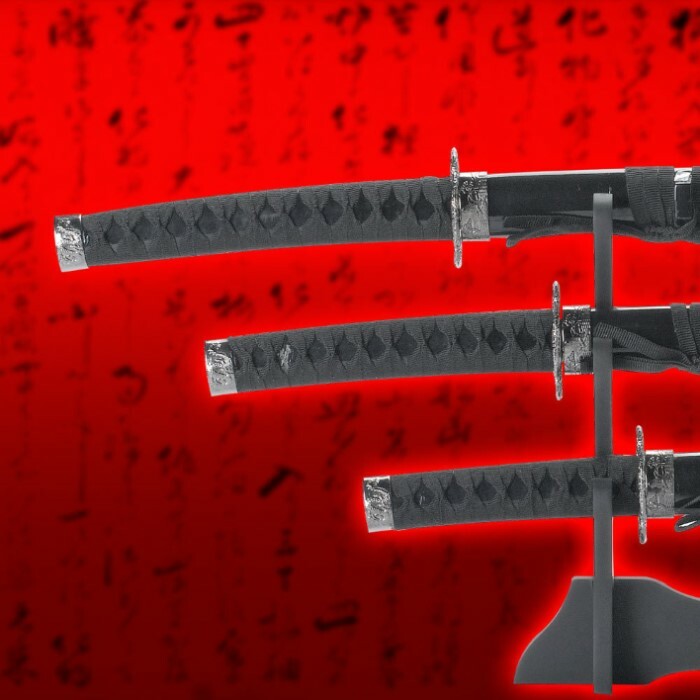 This Samurai Sword set offers you three distinct Japanese blade designs. Each sword is equipped with a carbon steel blade with heat-tempered finish. The nylon cord wrapped handles are accented with cast metal tsuba and pommel. The flaming black sheaths are adorned with coordinating cord wrapping. Not exactly what I expected but cool display. It's nice solely as a display, so for that purpose its great. Pick it up and you realize that the handle is completely hollow made with a very light and thin metal with a unbalanced heavy blade. These swords are great, but one thing I didn't like is that it has wax on the blade and it doesn't come off very easily. But it's still a great buy and I would definitely recommend it if you're looking for a sword set. I got the set 5 days after ordering. I'm no sword expert, but I can tell that these clearly aren't meant for actual combat. Of course, no one should spend $30 dollars for a set of three swords expecting them to be be battle ready. I got these purely for decorative purposes, and $30 is definitely a great price for that. The swords are fairly sturdy (no obvious loose parts), though I haven't actually hit anything with them, and the blades are already coated in a bit of oil. The mount is made of cheap material, but it works perfectly fine. The assembly was simple; three parts designed to press together (no screws nails or glue required). My one complaint is that the sheaths (scabbards, saya, or whatever) have a few chips. They're not noticeable from a distance, but if you take them off the shelf, you'd definitely see or feel them. Other than that, it's a great deal. The blade was high quality, however the handle was falling apart after the first use and quickly became useless. OMG...received this set today...I'm glad I got these..Excellent buy! I read a lot of reviews & researched before I orderd, & i'm proud to own this set. Ordered it on Friday & got it Tuesday. Thank you True Sowrds. You guys are awesome ! This sword is not full tang and therefore will snap, bend or worse, fly out of the handle if you decide to use this sword to cut branches etc. My first thought when I opened the box was: wow. This was my first purchase form this site and boy, I WASN'T disapointed. They have a slight edge, but from what i read from previous reviews, this was normal. For those of you who plan on only displaying these things, be careful, they have a point (I went a bit stab happy on the box). I was not disapointed and I will definitely buy from True Swords again.